The first pressing of Old the Front Page has sold out in record time – and by popular demand a new Extended Edition is now on sale, online and in branches of Waterstones across Scotland. Martin Kielty’s entertaining and thought-provoking title has captured the imagination of Scots history fans all over the world, and it’s been very well-received by readers and reviewers alike. 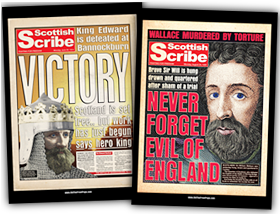 The book takes a look at how a fictional tabloid newspaper, the Scottish Scribe, might have presented some of the biggest stories in the nation’s history to an avid readership – if the right technology had been available since Roman times. The Extended Edition, including a foreword by acclaimed historical fiction author Robert Low (creator of the Oathsworn and Kingdom books) features 25% more front pages and can be distinguished from the first pressing by its yellow strapline. 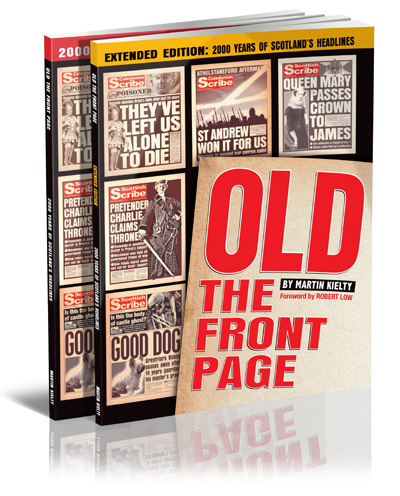 Old the Front Page: Extended Edition is on sale now – ask for it in your local branch of Waterstones. Cover price is £10 but you can save 15% by buying via this website.